The first problem was they were slightly too wide, it made for a very tight fit... I trimmed less than half a millimeter off the edge to solve that. I fixed this in the layout file. The second was that the card edge was not beveled, but I knew this going in because ExpressPCB doesn't do beveling as far as I know. I used the dremel to bevel the edge as well. It's not perfect, but it works. The third was that one of my traces didn't actually make it to the pad -- it was there, but was just barely not touching. Fixed that both on the board and in the layout file. The fourth was an outright layout error - one of the EPROM control pins was left floating when it needed to be tied high. That needs a jumper wire, but I patched that up too. The final problem I simply didn't foresee. 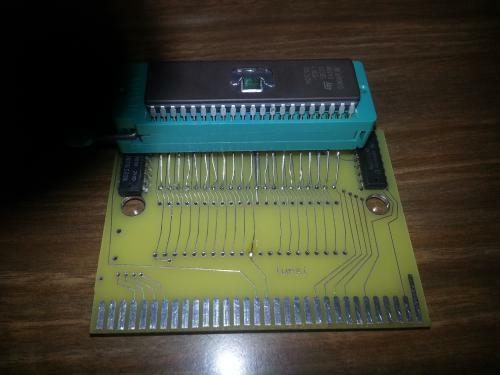 I had intended to use ZIF sockets on the first board to more easily test the ROMs, and I hadn't realized that the ZIF sockets were MUCH larger than the raw ICs, not to mention they wouldn't fit in the Genesis. So, I extended the pins on one socket, and attached just it for testing. The good news, is that Thunder Force 2 and the menu work perfectly on this, without the oddities I saw on the previous cartridge. (At least so far). I am going to independently test 3 and 4 with the single EPROM approach before I got for soldering one together permanently. But, before I went that far, I did one more thing. I felt bad that Thunder Force IV was not region free while 2 and 3 were, so I undertook to fix that. So, presumably, all we really need to do is set the "bne invalid" in the second block to "bra $620". Then, of course, we update the three game checksums previously discussed. They were pretty paranoid about region coding, eh? Anyway, the branch is too far for a short jump, so we end up overwriting both the bne and part of the tst.w. But, this should be okay. So, at $54C, replace "6608 4a78" with "6000 00D2"
At $18E, replace the checksum with "0977" - this should let it boot.